Around 90 hare coursing meetings will be held in Ireland in the coming months, with each event using around 100 hares. ANIMAL RIGHTS ACTIVISTS have said they are unhappy after the Department for Arts, Heritage and the Gaeltacht issued licenses for the coming hare coursing season to clubs around the country. The licences – issued by Minister Jimmy Deenihan to the Irish Coursing Club and its affiliated clubs – allows clubs to capture hares from the wild to use for coursing. It is estimated that around 90 coursing meetings will be held in Ireland between October and February, with each event using around 100 hares. 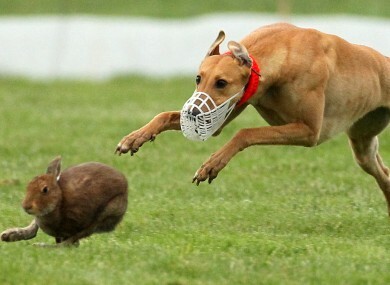 Animal rights activists say that coursing causes huge suffering to thousands of hares. “The Irish hare population has undergone a substantial decline in the past 15-25 years while some populations have fallen to critical levels in certain areas,” said Fintan Kelly of the Irish Wildlife trust. “There is absolutely no rational justification for trapping hares and using them to provide entertainment for a small minority who enjoy seeing them chased down and terrorised by dogs,” he said. A spokesperson for the Department of Arts, Heritage and the Gaeltacht said that spot checks would be carried out on some events to ensure they comply with the rules, including one which requires dogs to wear a muzzle - but that it depends on how much money is available to do so. “Where resources allow, officials of the National Parks and Wildlife Service of the Department attend coursing meetings, on a spot-check basis, to monitor compliance with conditions on the licences granted by the Minister,” the spokesperson said. During the 2012/13 seas, more than 50 per cent of the meetings were monitored, the spokesperson said. Email “Animal rights activists unhappy as Department issues licences for hare coursing”. Feedback on “Animal rights activists unhappy as Department issues licences for hare coursing”.